This post is brought to you by Fairy Australia. There are ways to make this task a little easier and bearable. A dish washing machine is a real life saver. If this is not an option, getting a good quality dish washing liquid will certainly improve the experience. My definition of a good quality dish washing liquid is that it can cut through grease easily and it doesn’t require a lot of product to wash dishes (super concentrated). Now that UK’s number 1 iconic green dish washing liquid detergent – Fairy – is available in Australia, its quality was put to the test. The Fairy brand ambassador, celebrity chef Ben O’ Donoghue, has recently catered his popular dishes such as his Spaghetti Bolognese to the locals of the Margaret River – a town with more than 10,000 people . Imagine the amount of dishes which needed to be washed afterwards! According to Ben, his team were able to wash nearly 9,600 plates used during the feast with one 650ml bottle of Fairy Dishwashing liquid. Talk about action speaking louder than words huh? I wanted to try Ben’s spag-bol recipe but I stumbled upon his smashed broad bean and mozzarella recipe instead. The weather in Orange has warmed up big time and salad seems like an appropriate meal for the weather. 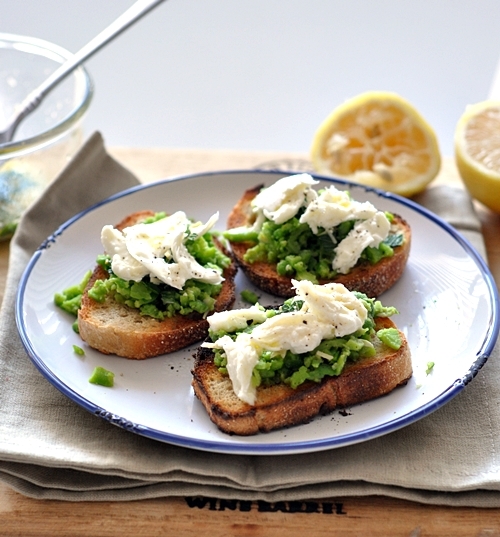 As I haven’t worked with the fresh broad beans before this recipe was the perfect excuse. Although the process of removing the beans from the pods to boiling and removal of their “second” skin was a little fiddly, it totally worth the effort. Simply because I was reminded the freshness and sweetness of beans taken out of their pods instead of the plastic bags (the frozen kind). Prepare the dressing first by mixing lemon juice, pecorino (or parmesan), herbs and 4 tbsps olive oil. Set aside. To prepare the broad beans – remove the beans from the shell, then boil the beans for 3 – 4 minutes and remove the pale green skin by peeling the top of each bean a little and slip out of the pale outer skin revealing the deep green bean. 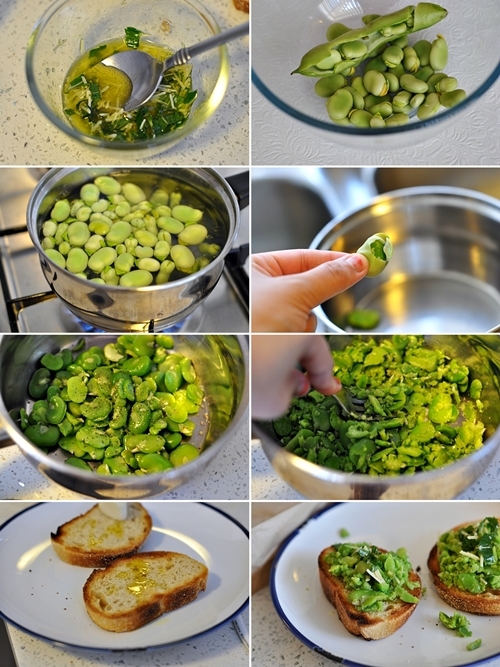 “Smash” the broad beans with a pinch of salt. The original recipe suggested a big pestle and mortar or a food processor (but be careful of not overdoing it in order to maintain the chunky texture). But a fork worked just fine for me. 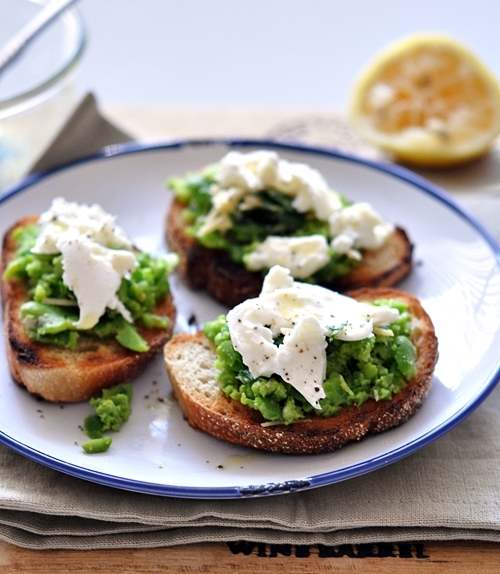 Toast the bread slices and then rub with garlic and drizzle with some olive oil. 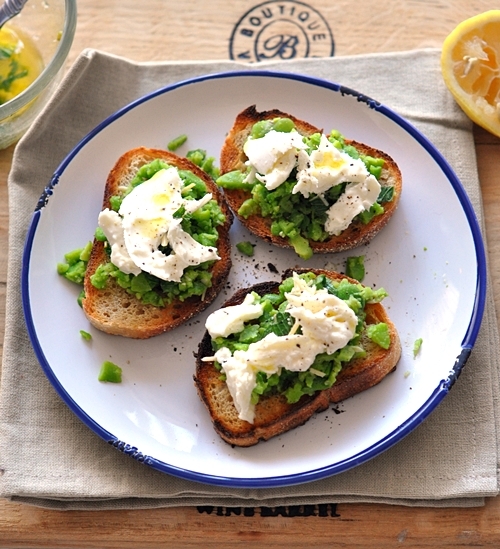 Pile the broad bean mash on the toasts and tear the mozzarella into chunks and sit on top of the mash. Finish with drizzle of olive oil, a grinding of black pepper and herbs. Gorgeous! This looks super tasty, yum.